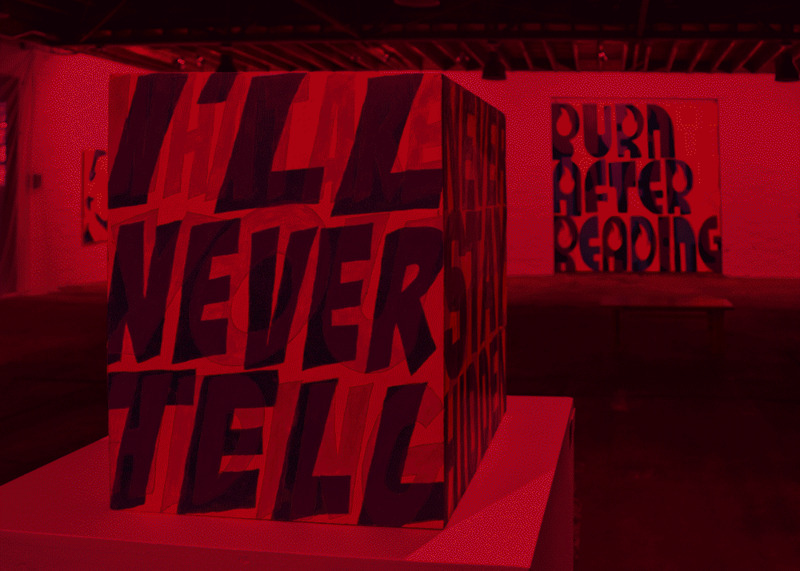 Shepherd Production Artist Jason Tetlak celebrated his art show, Burn After Reading, with a special performance Saturday night – a burning of all unsold paintings, and an unexpected interactive game-show closing. 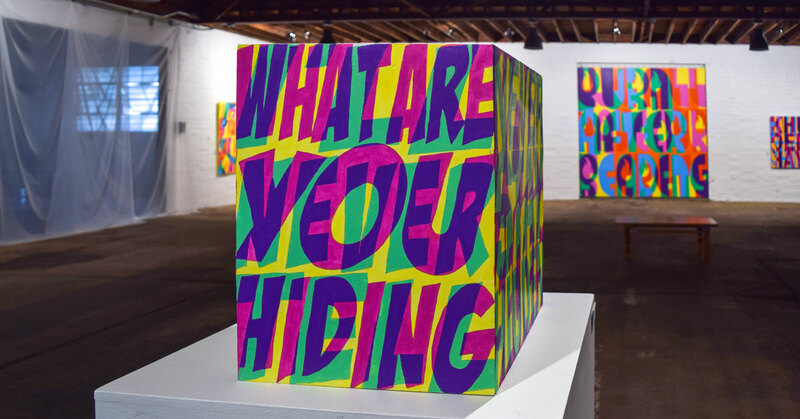 Burn After Reading was on display at SPACE 42 art gallery from Dec. 14 through Jan. 12, and featured interactive, brightly-colored pop art and paintings. 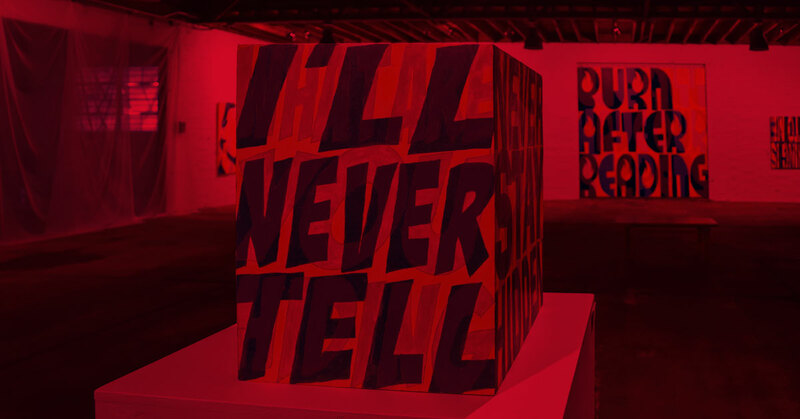 Each piece was created as a “red reveal” so that when viewed with a red light, an underlying image or message was exposed. Widely known for his murals, including last year’s Guinness World Record for largest 3D mural, Tetlak once again infused a sense of provocative meaning and influence to his latest series of art. The show exhibited themes of secrecy, hidden messages and the thoughts we as people hide from one another. Over the last eight months, Tetlak created 15 pieces for Burn After Reading’s debut. “Each painting invites the viewer to take a closer look – often commenting on the dark or absurd reality lurking just beneath the happy, colorful surface fluff that society presents to us on a daily basis,” Tetlak said. As part of his overarching philosophy when it comes to art, Tetlak chose to burn all unsold pieces upon the exhibit’s closing. As an unexpected twist to the closing night, Tetlak created a giant game-show-inspired wheel with various destinies for each remaining piece. Those in attendance were responsible for choosing the fate of each unsold work of art, with options like What’s In Your Wallet?, Heads or Tails, Auction, Physical Challenge, Mental Challenge, Half Price, or Buy It or Burn It. “It was one of the best performance art experiences I’ve ever had,” said one attendee, commenting on the divided crowd and the polarization of those who wanted the art to burn and those who wanted it to be saved. Learn more about Tetlak and his latest show via Jacksonville Business Journal and First Coast News.